Thank you all so much for coming out to my "Myths and Mermaids" show! We had a fabulous time & a very successful event. Most of the original paintings have sold, but there are a couple left - contact Pop Gallery via email popgallery@me.com or call them at 407-827-8200 if you are interested in acquiring any remaining originals. I will be posting all the new art from the show online over the next week or so, so keep an eye out for updates at Strangeling.com. Matt & I are preparing to travel up to our KC house for family holidays, but our website & eBay stores will remain open throughout the holiday season (however in some instances shipping and emails may be slightly delayed). At this time too, we cannot guarantee that any new orders will arrive in time for Christmas. 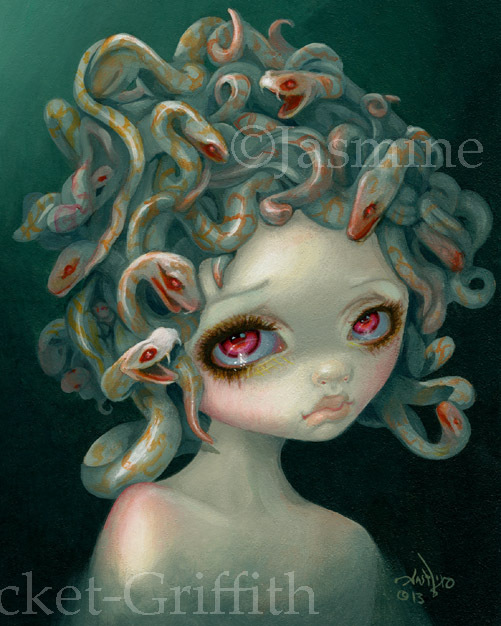 From my "Myths and Mermaids" solo show at Pop Gallery at Downtown Disney, here is "Pale Medusa." My goal in this painting was to show something slightly awful and creepy as being beautiful. I kept this piece mostly monochromatic, as if they were albino snakes - with a touch of gold and pink. The original painting herself sold at the show, but I have prints, posters & other merchandise available! 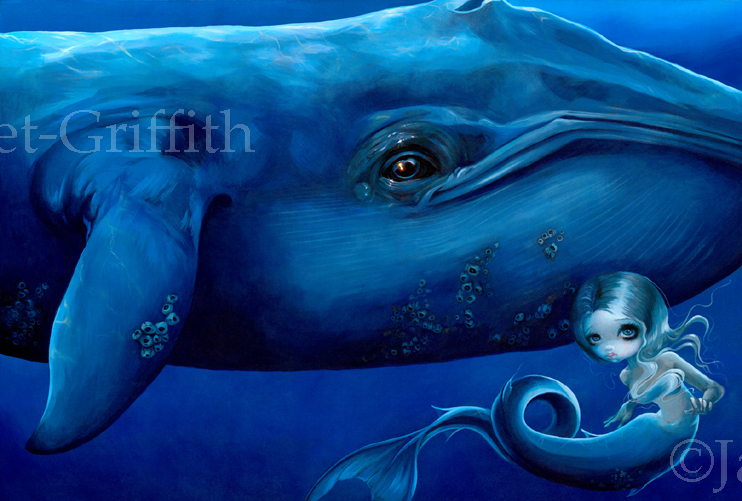 From my "Myths and Mermaids" solo show at Pop Gallery at Downtown Disney, here is "Big Blue Whale." A very big painting, showing the largest animal that has ever lived - the Blue Whale. I kept a limited palette of blue tones on this one, and of course - he has a mermaid friend! The original painting itself sold at the show, but prints, Limited Edition Canvases from Pop Gallery, & other merchandise is available! Big Limited Edition Hand Embellished Canvas prints are Pop Gallery Exclusives and are the big gallery oversize format - 30" wide by 20", hand accented by me in acrylic paints, signed & numbered out of 42, and are $995. Available only from Pop Gallery at Downtown Disney in Florida (also upon request at Hoypoloi Galleries) - they will ship WORLDWIDE - you can email them at popgallery@me.com by calling them at 407-827-8200 and letting them you'd like like to place a "special order" for Jasmine's "Big Blue Whale".